Experiments show that neurons have a tendency to respond to signals tuned to a resonant frequency . In order to understand the general properties of a resonant response of a neuron, we study the silent Hodgkin-Huxley neuron driven by periodic input. The current arriving through the synapse consists of a set of spikes I p (t) ~ gsyn ∑(t/τ) exp(-t/τ) C(t) (V a -V syn ), where g syn is the synapse conductivity, τ is the time constant associated with the synapse conduction, Va is the maximum membrane potential and Vsyn is the reversal potential of the synapse. The phase diagram for typical HH model parameters in the limit of small synaptic conductivity. There is a well-pronounced minimum at T i = 17.5 ms. 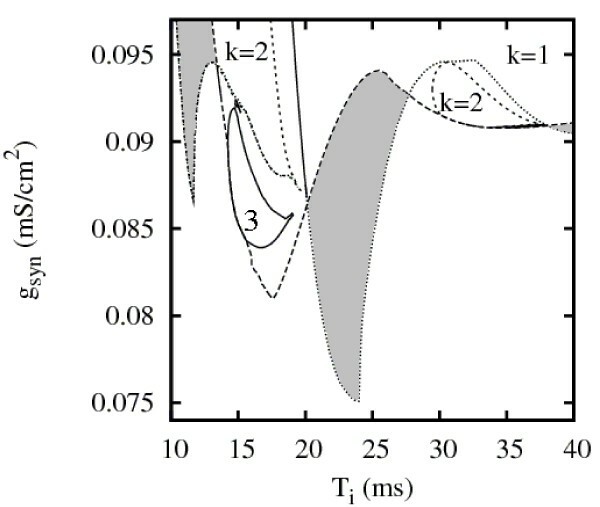 The resonant nature of the response can be seen also at multiples of this value, at T i ≈ 34 ms and T i ≈ 50 ms. Near the resonance the system has the tendency to mode locking with high values of k, where k = T o /T i is the ratio of the output ISI to the input ISI. For example near the main resonance frequency we find narrow regions with k = 5, 6 or 9. Areas with bistable solutions are shown in grey. We expect the resonance at T i = 17.5 ms to survive in the presence of noise. 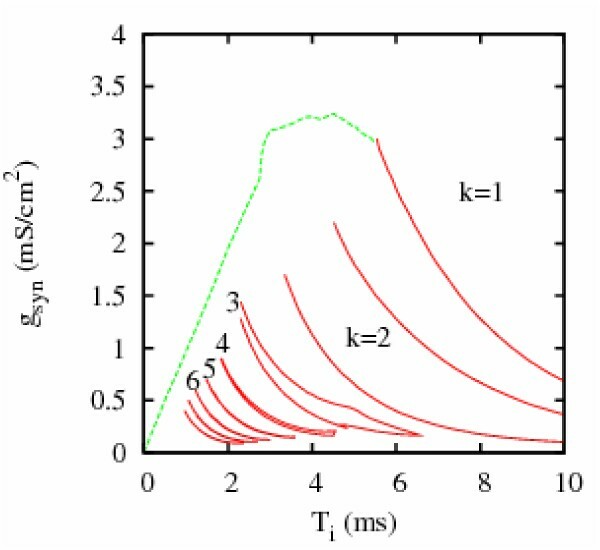 In the limit of small T i the distinction between the firing spikes and subthreshold oscillations disappears and the output signal decreases to 0 for sufficiently large g syn . Broken line in the figure indicates a transition to nonfiring behavior. In the area below this transition the amplitude of the spikes gradually increases. Solid lines are borders of the mode-locked states with different values of k. Properties of this model are similar to the HH model with a sinusoidal driving current at intermediate values of input ISI Ti = 5–12 ms. However the results in both the high and the low frequency regime are qualitatively different. In the case of a sinusoidal input there is only one resonance frequency and reported values of k are lower . Part of the numerical computation was performed in the Computer Center of the Tri-city Academic Computer Network in Gdansk, Poland.